Software import Outlook PST File into Exchange 2016, 2013, 2010, 2007, 2003. Exchange Administrative Permissions required to migrate Outlook PST File to Exchange. Software Informer awarded Exchange Import the Ultimate contribution to data migration. 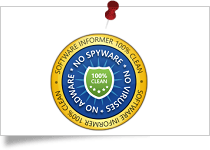 SoftPedia awarded SysTools Exchange Import Tool the 100% secure and virus free award. 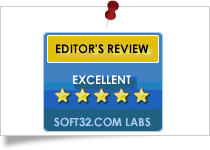 Cnet awarded SysTools PST to Exchange Server the overall 5-star rating. Soft32 awarded SysTools Import PST to Exchange Software the Outstanding Exchange product. All the PST files on your machine or in your local network are searchable to import multiple PST to Exchange 2016, 2010, 2007 & 2003. This PST file to Exchange mailbox Import software helps you add folder containing multiple PST files and mass import them from Outlook to Exchange Server mailbox without any hassle. Moreover, you can import both password protected and inaccessible PST file to Exchange Server also. While bulk importing Outlook PST files into Exchange mailbox, software allows users to converts the complete data from PST file. You can import emails, contacts, calendar, tasks, notes & journals, etc., from MS Outlook to Exchange in just a few simple clicks. Moreover, the software will maintain all Meta properties of the data intact even after migrating PST to Exchange 2016, 2010, 2007 & 2003. If you want to import PST file(s) across the Local network then network searching option is also available. You can easily search for PST file within the domain network without any hassle. In order to add PST file from workgroup network, simply browse it via Add File button. The Outlook to Exchange software will locate all the machines available on the network and prompt you to provide server domain credentials. Afterwards, you can select any of the machines and all the PST files from it will get loaded automatically. This tool offers Granular Level or selective file migration to import PST to Exchange 2016, 2010, 2007 & 2003 server. Once the software searches PST files on the selected network machine, it will list all the PST files. Now, if you want you can check or uncheck the PST files to select/deselect them and Move the desirable Outlook PST into Exchange Server private folder mailbox. You are also allowed to search within the specific drive and Add PST file in the queue. While importing PST into Exchange, the software facilitate you to search mailboxes within the Sub-domain also. Now, to enable this option, you need to choose "Search User in Sub-Domain" option. This PST to Exchange Import Tool will allow you to search user mailboxes within the subdomain without any trouble. 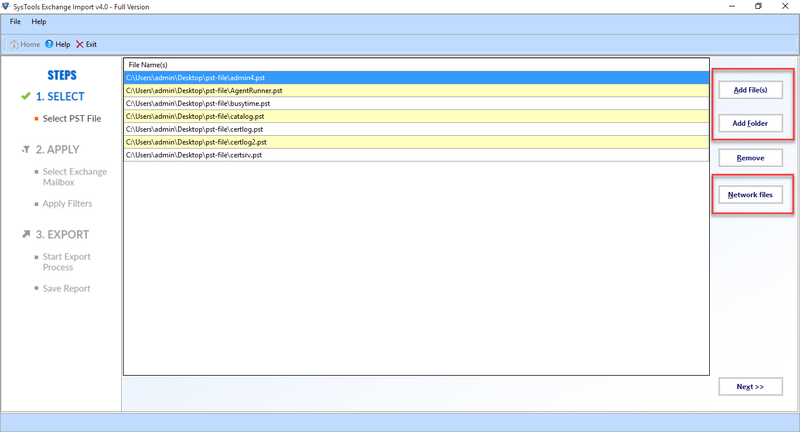 Tool Import PST Contacts to Exchange, and also exclude duplicate contacts from Outlook PST file while importing. This option is useful when you have duplicated contacts within the PST File. If you do not want to include them, simply check Exclude Duplicate Contacts option from the select categories. 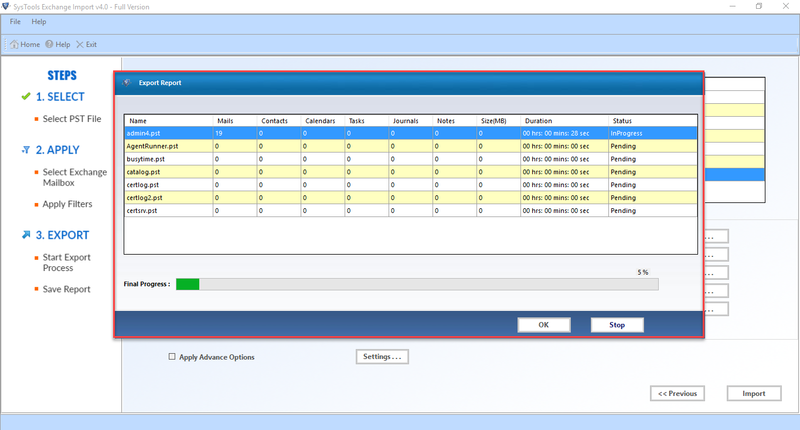 This will prevent you from Importing Duplicate Contacts from PST to Exchange. With the help of this Exchange Import software, you can import all data items from PST to Exchange Mailbox at Granular level.It permits you to export PST Items from selected Categories also. For example, Mails, Calendars, Contacts, Tasks, Journals and Notes. Tool enables users to perform selective data migration from PST File into Exchange 2016, 2010, 2007 & 2003 Mailbox. Another impressive feature offered by the software is that it lets users apply filters on Mails, Calendars, Contacts, Tasks, Journals and Notes to prevent unnecessary data migration. This allows you to import data from a selective date range as specified by user. In order to apply date filter while you import PST File to Exchange, you need to specify "From" & "To " for the date range. The mapping feature of software helps to Import PST to public folder of Exchange Server mailbox. For doing this, you need to provide the SMTP address of the account. After this, each PST file will get imported into the respective mailboxes of Exchange server. In addition, if you check the Maintain Folder Hierarchy option, then it map PST file folders with the respective folder in Exchange. Otherwise it creates a separate folder with same name of PST file in Exchange mailbox. Once the Mailbox files get imported from Outlook PST to Exchange Server mailbox, the software will show the complete conversion report. It will show you the current status of a number of emails, contacts, calendars, journals, tasks, notes being migrated from PST to Exchange. After this, a final report will be generated with the overall conversion. Use Trail Version to Import PST file to Exchange 2016, 2013, 2010, 2007, 2003 etc. Trial version of Exchange Import software import 25 items/folder from selected PST mailbox. To import the data directly into a live Exchange server - Exchange 2003, 2007, 2010, 2013 & 2016 Destination Versions are supported. Exchange Mailboxes should have complete administrative rights for Exchange (2000-2003,2007-2016) Versions. Make sure the machine should be in same domain as Exchange Server. MS Outlook – Outlook 2000, 2003, 2007, 2010(32/64 bit), 2013 (32/64 bit), 2016 (32/64 bit). Exchange Server – MS Exchange 2016, 2013, 2010, 2007, 2003, 2000 (32 & 64-bit). What are the migration steps I need to follow? Exclude duplicate contacts while uploading PST files into Exchange Server Mailbox. Can I use PST to Exchange Import tool on Windows 10 machine also? Yes, the software can be easily installed and used to import PST to Exchange 2016 and any version of Microsoft Windows OS, including Windows 10. Is it possible to import multiple PST files into Exchange Server? I am having multiple PST files that I need to save in different Exchange accounts. So, want to make sure that is it possible to import multiple PST files to multiple Exchange accounts with the help of this application or not. Yes, you can select multiple PST files to be imported in multiple Exchange mailboxes without any hassle. However, just make sure that migration machine and Exchange Server are must be under the same domain. Do I need to have Microsoft Outlook installed on my machine to perform this PST to Exchange migration? If you want to import PST file to Exchange 2003, then it is necessary to have Outlook installed on the local machine. Otherwise, Outlook installation is not mandatory to upload PST into Exchange Mailbox 2016, 2010, 2007 . Why am I getting "Unable to import the following MS Outlook PST files in the Exchange 2010 Server" error? You must have full access permission of Exchange mailbox in which you want to Import PST files into Exchange Server. If not, then first acquire full admin rights for the respective Exchange Mailbox. To know more about it check below links. Migration machine and Exchange Server must be in same domain. Check bits of Outlook and install setup accordingly as one installer is for 32-bit Outlook and other one is for 64-bit Outlook. How can I check bit version of MS Outlook? First of all launch MS Outlook application, go to File tab and click on the Help option. Now, under the "About Microsoft Outlook", look at the version number either it is 32-bit or 64-bit. What size of PST files does the software support? My PST file is of 35 GB in size and I need to import PST Files into Exchange 2013. Will it be possible with help of this PST to Exchange Import tool? The application is designed in such a manner that it supports PST file of all size i.e. both ANSI as well as UNICODE type PST. However, it does not impose any size limitation on PST file size while you move PST File into Exchange Server. Does the software allow me to add PST files from the network also? Can I Import PST Calendar to Exchange 2010 Mailbox ? Does the tool support Microsoft Exchange 2016 version also? 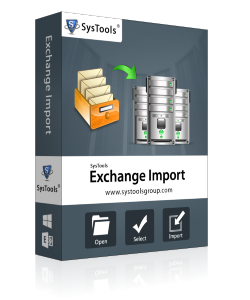 Yes, Exchange Import Tool is compatible with all version of Microsoft Exchange Server, including Exchange 2016, 2010, 2007 & 2003. 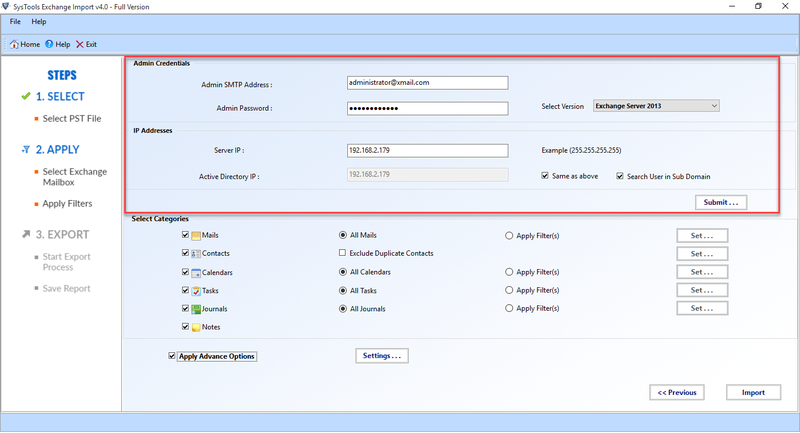 Is it necessary to have Exchange Server in an active state during PST to Exchange migration? Does the tool provide an option to exclude duplicate contacts while moving pst file to exchange server? Yes,the application is smart enough as it let users exclude duplicate contacts while importing PST contacts to Exchange . A user just needs to check this option before initiating the process to move PST File into Exchange Server. You have not selected no. of Mailboxes. A number of our old user accounts were archived as Outlook Data Files. Mounting them one by one on Exchange mailboxes was a tiresome task that consumed a lot of productive hours. However, we were lucky to find out this tool which worked wonderfully and import Outlook PST to public folder Exchange 2007 in bulk. Besides being a very efficient utility, the software also happens to be an intelligent and powerful tool. It let me browse PST file domain network also without any hassle. With less end user efforts demand and limitless transfer provided, the Outlook to Exchange Mailbox Importer has what it takes to be a great tool! I tried with SysTools PST to Exchange Import Tool and I must say the support team is very cooperative and help me in each and every step where I stuck. Thanks to the team for wonderful customer support and perfect tool to import PST to Personal folder in Exchange . It is the best tool in terms to import PST to public folder of Exchange 2007 mailboxes. Just login and import unlimited number of PST files in bulk in just a few simple clicks. I must say that it has been a pleasure while working with this software. Confused whether tool allows to move Outlook Calendar from PST to exchange mailbox or not. Not only amazed with the option to transfer select specific items, but the tool also equipped with Date Filter help in saving my Calendar Details. Our organization was migrating data to another location. We successfully generated PST of the data but our main challenge was copying PST file to Exchange Server. Your product helped us in this task and we are glad that we completed migration process & import PST to Exchange Mailbox 2010 without any data loss. Thanks a lot! There were lots of duplicate contacts in my Outlook file and I do not want import PST contacts to Exchange 2013 Server. Thanks to this Exchange Import tool for helping me in such a great way. 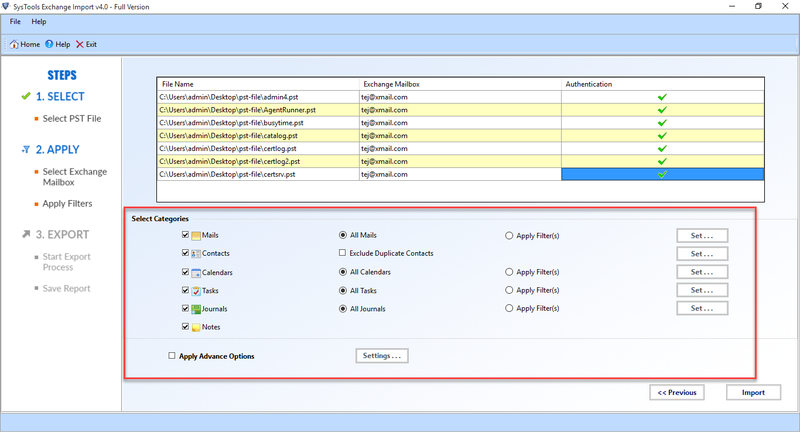 It provides me an option to Exclude Duplicate Contacts from Outlook PST file during the import process. Great tool! !